The Hitchhiker's Guide to the Galaxy is a 2005 British-American science fiction comedy film directed by Garth Jennings, based upon previous works in the media franchise of the same name, created by Douglas Adams. It stars Martin Freeman, Sam Rockwell, Mos Def, Zooey Deschanel and the voices of Stephen Fry and Alan Rickman. Adams co-wrote the screenplay with Karey Kirkpatrick but died in 2001, before production began; the film is dedicated to him. The film grossed over $100 million worldwide. The film begins with a Broadway-style number, "So Long, and Thanks for All the Fish", sung by the dolphins of the world, who are aware of the Earth's impending doom. At the end, they all jump out of the oceans and fly off into space, leaving Earth forever. One Thursday morning, Arthur Dent discovers that his house is to be immediately demolished to make way for a bypass. He tries delaying the bulldozers by lying down in front of them. Ford Prefect, a friend of Arthur's, convinces him to go to a pub with him. Over a pint of beer (as "muscle relaxant"), Ford explains that he is an alien from a planet in the vicinity of Betelgeuse, and a journalist working on the Hitchhiker's Guide to the Galaxy, a universal guide book, and that the Earth is to be demolished later that day by a race called Vogons, to make way for a hyperspace bypass. Suddenly, a Vogon Constructor Fleet appears in the sky and destroys the planet. Ford saves himself and Arthur by stowing away on a Vogon ship. When discovered, they are thrown out of an airlock, but are picked up by the starship Heart of Gold. They find Ford's "semi-cousin" Zaphod Beeblebrox, the President of the Galaxy. He has stolen the ship along with Tricia "Trillian" McMillan, an Earth woman whom Arthur had met previously, and Marvin the Paranoid Android, a clinically depressed robot that constantly complains about life. Zaphod explains that he is seeking the planet Magrathea, where he believes he can discover the Ultimate Question of Life, the Universe, and Everything to match with the disappointing answer given by the supercomputer Deep Thought: "42". Zaphod stole the Heart of Gold to use its improbability drive to get to Magrathea through trial and error. During one of these attempts, they end up on the planet Viltvodle VI. Zaphod decides to visit Humma Kavula, his opponent from the election. Upon learning of Zaphod's plan, Kavula announces that he has the coordinates to Magrathea. He takes one of Zaphod's two heads hostage and demands they bring him the Point-of-View gun created by Deep Thought, which allows the target to understand the shooter's point of view. As they are leaving the planet, Trillian is captured by Vogons. The others travel to rescue her from the Vogon home world bureaucracy, facing long lines and frustrating form processing. Trillian learns of the Earth's destruction, and is outraged to learn that Zaphod signed the authorisation for the destruction of Earth thinking it was a request for an autograph. The Heart of Gold is chased by the Vogons, led by Galactic Vice-President Questular Rontok, who is attempting to rescue Zaphod from himself, after an incident in which Zaphod kidnapped himself in order to forgo presidential duties. The Heart of Gold arrives at Magrathea only to be targeted by the planet's automated missile defense systems. Arthur activates the improbability drive to escape, resulting in the ship reappearing exactly where they were, with the missiles transformed into a sperm whale and a bowl of petunias. On the planet, Zaphod, Ford, and Trillian take a portal to Deep Thought, but Arthur hesitates, and the portal closes before he and Marvin can use it. The trio encounter the computer and ask it whether it has calculated the ultimate question, it reveals that it designed another supercomputer to do so—Earth. When the trio finds the Point-of-View gun, Trillian shoots Zaphod, making him understand how she feels about the destruction of Earth, as well as how much she loves Arthur. Meanwhile, a Magrathean called Slartibartfast appears and takes Arthur on a tour of the factory construction floor where Earth Mark II is being built. Slartibartfast takes Arthur to a recreation of his home on the new Earth, where the others are enjoying a feast provided by the pan-dimensional beings who commissioned Arthur's original Earth, and who resemble a pair of mice. The mice, who constructed Deep Thought, used the supercomputer to build an even larger supercomputer, the planet Earth, to determine the Ultimate Question. Believing Arthur, the last remaining supercomputer component, may hold the Ultimate Question, the mice restrain Arthur in order to remove his brain. Initially panicking, a resigned Arthur futilely attempts to dissuade them from doing so, admitting that the only question that ever mattered to him was whether Trillian was "the one", the answer to which Arthur realises is "yes". But the mice continue, unconvinced, believing Arthur's Question to be "Tripe", and wanting to be famous rather than happy. Arthur panics again, but, as his survival instincts kick in, Arthur breaks free of his restraints and squashes the mice under a teapot. The mice, returning to their original forms, disappear into thin air, never to be seen again. Outside the house, the group is then confronted by Vogons, who open fire. As the group takes shelter, Marvin is left outside and, despite being shot in the back of the head, recovers and uses the Point-of-View gun on the Vogons, causing them to become depressed and unable to fight. As the Vogons are taken away and Questular rejoins with Zaphod, Arthur chooses to explore the galaxy with Trillian and Ford and lets Slartibartfast finalise the new Earth without him. The Heart of Gold crew decide to visit the Restaurant at the End of the Universe. Thomas Lennon voices Eddie the shipboard computer. Preparations for the premiere of The Hitchhiker's Guide to the Galaxy on Leicester Square. Bringing The Hitchhiker's Guide to a theatrical version started as early as the 1970s, as documented in The Greatest Sci-Fi Movies Never Made by David Hughes. Douglas Adams had been approached by one unnamed producer and separately by the American Broadcasting Company network during the 1970s to turn the book into a film, but Adams refused both offers, as he feared they wanted to turn the work into "Star Wars with jokes". In 1982, Adams signed an option for the film with producers Ivan Reitman, Joe Medjuck, and Michael C. Gross, and completed three scripts for them. As part of the rewrites, Medjuck and Gross offered the idea of bringing in either Bill Murray or Dan Aykroyd to play Ford Prefect. However, Aykroyd separately proposed a different story to Reitman, which lead to this project becoming the basis for Ghostbusters. This left Adams flustered about the film's development, making sure there was the necessary commitment to the project. However, the event did serve the idea of making Prefect an American as to better draw in that audience. Movement on the film was quiet until around 2001, when director Jay Roach, using the clout he had gained from Austin Powers: International Man of Mystery and Meet the Parents, secured a new deal with Adams and production through Disney. Adams wrote a new script, and Roach sought talent like Spike Jonze to direct, Hugh Laurie to play Arthur and Jim Carrey as Zaphod, but then Adams died on May 11, 2001. Roach nor the film's executive producer Robbie Stamp wanted to see their work go for naught after Adams' death. Roach brought in Karey Kirkpatrick to complete the screenplay based on Adams' final draft, submitted just before his death. Kirkpatrick used what notes Adams had left, finding that Adams was willing to go off the book's narrative to adapt to the film. He considered his screenplay something in the spirit that Adams had set out based on the whole of Adams' work. Some time after Adams' death, Roach decided to drop out of the project; on Spike Jonze's recommendations, Roach turned to director Garth Jennings and producer Nick Goldsmith, collectively known as Hammer & Tongs, to take up the work. Spike Jonze was one of several directors asked to do the film; Jonze turned the job down, recommending that the producers hire Hammer & Tongs. The hardest character to cast was "the voice of the Guide itself and in the end came back to somebody who was one of the people Douglas himself had wanted, namely Stephen Fry." "Douglas himself is on record as saying that as far as he was concerned the only character who had to be British, indeed English, was Arthur Dent." "I think that a lot of fans would be surprised to know just how much of a free hand we have been given in the making of this movie. I know how easy it is to see every decision to cut a scene as 'studio' pressure but it was always much more to do with pacing and rhythm in the film itself." "The script we shot was very much based on the last draft that Douglas wrote... All the substantive new ideas in the movie... are brand new Douglas ideas written especially for the movie by him... Douglas was always up for reinventing HHGG in each of its different incarnations and he knew that working harder on some character development and some of the key relationships was an integral part of turning HHGG into a movie." Shooting was completed in August 2004 and the movie was released on 28 April 2005 in Europe, Australia and New Zealand, and on the following day in Canada and the United States. The pre-title sequence of the film was shot in Loro Parque, Puerto de la Cruz, Tenerife. The film trailer featured voice over work by Stephen Fry as the Guide, describing the Hitchhiker's Guide to the Galaxy's entry on movie trailers. An audio collection called "Additional Guide Entries", read by Stephen Fry, was released to iTunes to promote the film. The entries were set to music by Joby Talbot, and written by Tim Browse and Sean Sollé (with the exception of the How to be Cool entry, which was also co-written by Yoz Grahame). The "Hitchhiker's Guide to Technology" claims that if you make yourself a cup of tea and attempt to get an object working and the tea goes cold before you finish, you are dealing with technology. Other guides include the Hitchhiker's Guide to Blogging, the Hitchhiker's Guide to Deadlines and the Hitchhiker's Guide to How to be Cool which discusses how an individual can truly be cool, instead of by following crowds, but concludes by suggesting the listener attend a showing of The Hitchhiker's Guide to the Galaxy. The Guide to Websites, which only appeared on the official UK movie website, described a website as "a wonderful new invention that allows people you neither know nor care about to inform you what they had for breakfast this morning, without all that tedious mucking about in the postal system". The Guide to Fanboys, written by Touchstone Pictures' copywriters as part of their promotion of the movie, only ever appeared as website text. Though released at the same time as the iTunes entries, it was never intended to be recorded and is otherwise unconnected with the Fry/Talbot/Browse works. Rotten Tomatoes, a review aggregator, reports that 60% of 194 surveyed critics gave the film a positive review; the average rating is 6.1/10. The site's consensus reads: "A frantic and occasional funny adaptation of Douglas Adams' novel. However, it may have those unfamiliar with the source material scratching their heads." Metacritic gives it 63/100, indicating "generally favourable" reviews. Empire magazine rated the film four stars out of five and said it was a "very British, very funny sci-fi misadventure that's guaranteed to win converts". Manohla Dargis called it "hugely likable" with a story arc structured "more or less" as "a long beginning and then an ending"; she calls Jim Henson's Creature Shop's Vogons "beautifully constructed" and noted that Sam Rockwell's performance is "sensational, ... riffing on Elvis and the current President George Bush". Peter Bradshaw gave the film three stars out of five and said, "The film is no disgrace, and honours the Guide's gentle, low-tech BBC origins. But it doesn't do justice to the open-ended inventiveness of the original. The inevitable Anglo-American accommodations of casting have muddled its identity and the performances of the new American stars can be uneasy. It somehow seems heavier-footed and slower-moving than Adams's concept; the gravity is stronger... The savour and flavour of the Adams original, its playfully ruminative feel, has been downgraded in favour of a jolly but less interesting outerspace romp." Philip French, after describing the Vogons as "a species resembling Laughton's version of Quasimodo" and writing it is "not, except in its financing, anything resembling a standard Hollywood production", called the film "slightly old-fashioned (few things date as rapidly as science fiction and our view of the future) and somewhat commonplace through its embracing familiar special effects. The jokes have to compete with the hardware and the actors executing them often exude a feeling of desperation... It's funnier, and obviously cleverer, than Spaceballs, Mel Brooks's puerile spoof on Star Wars, but a good bit less engaging than Galaxy Quest." The movie was released on 28 April 2005 in the United Kingdom making £4,200,000 in its first week. It was released a day later in North America, making $21,103,203 in its opening weekend, opening in first place. In the United States, the movie remained in the box office top ten for its first four weeks of release. The movie's total box office gross was $104,478,416 worldwide. According to Freeman, the film would unlikely merit a sequel; he stated "I found that out from the horse's mouth, [director] Garth Jennings. I had dinner with him and he said [the first one] just didn't do well enough." The movie was nominated for seven different awards and won one. It won the Golden Trailer Award under the category Most Original. It was nominated for: the Artios award from Casting Society of America, United States under the category Best Featured Film Casting-Comedy in 2005; the Empire Awards from Empire Awards, UK under the categories Best British Film and Best Comedy in 2006; the Golden Trailer from Golden Trailer Awards under the category Best Voice Over; and Teen Choice Award for Choice Movie: Action and Choice Rap Artist in a Movie: Mos Def. "So Long, and Thanks for All the Fish (song)" redirects here. For the A Perfect Circle song, see So Long, and Thanks for All the Fish (A Perfect Circle song). The Marvin Mixes are remixes of a new version of "Reasons to be Miserable", here performed by Stephen Fry, as well as a new vocal and a new instrumental track for "Marvin", also performed by Fry. Stephen Moore had recorded the vocals of both tracks in 1981. The Guide Entries are new spoken "Hitchhiker's Guide" entries, all read by Fry, with accompanying music by Joby Talbot (with further orchestrations by Christopher Austin), who wrote the film score. The soundtrack CD was released on 26 April 2005, by Hollywood Records. The CD has the same 33 tracks as the previous iTunes release. The enclosed booklet includes acknowledgements from Joby Talbot and notes on the creation of the song "So Long and Thanks for All the Fish", written by Garth Jennings. The track "Huma's Hymn" on the soundtrack is notable for the fact that it was sung in St. Michael's Church in Highgate, London by members of local church choirs along with a congregation consisting of members of the public. The recording was open to anyone wishing to attend, and was publicised on the internet, including in a post to the Usenet group alt.fan.douglas-adams. The first version of the song "So Long, and Thanks for All the Fish" is a Broadway-style, lively version sung by the dolphins before they leave Earth. The second plays over the end credits and is in the style of Smooth jazz. The song was written by English composer Joby Talbot, conductor Christopher Austin, and director Garth Jennings and performed by the Tenebrae Choir. Neil Hannon, founder and frontman of the Irish pop group The Divine Comedy, of which Talbot is a former member, lent his vocals to the version of the song played during the ending credits. The song, in its "bouncy", opening version, was translated into and performed in Spanish for the Latin-American Region 4 DVD release. A reworked version of the theme from the 1981 television adaptation was also included in the score. The "Gift Set" edition includes a copy of the novel with a "movie tie-in" cover, and collectible prints from the film, packaged in a replica of the film's version of the Hitchhiker's Guide prop. Single disc widescreen and full-screen editions (Region 1, NTSC) were released in the United States and Canada on 13 September 2005. They have a different cover, but contain the same special features (except the Don't Crash documentary) as the UK version. Single disc releases in the UMD format for the PlayStation Portable were also released on the respective dates in these three countries. The movie was made available as a paid download in the iTunes Store starting in September 2006, for the American market only. A region-free Blu-ray Disc version was released in January 2007. ^ "The Hitchhiker's Guide to the Galaxy (PG)". British Board of Film Classification. Retrieved 24 May 2016. ^ a b c "The Hitchhiker's Guide to the Galaxy". Box Office Mojo. Retrieved 12 February 2015. ^ "The Hitchhiker's Guide to the Galaxy". The Numbers. Retrieved 12 February 2015. ^ "The Lost Roles Interview with Tom Lennon". vulture.com. 10 January 2013. Retrieved 24 September 2018. ^ a b c d e Reynolds, Andrew (9 March 2017). "Star Wars with Jokes: The Hitchhiker's Guide to the Galaxy Movie". The Doctor Who Companion. Retrieved 11 February 2019. ^ a b Dargis, Manohla (29 April 2005). "The Way the World Ends, With a Shrug and a Smile". The New York Times. Retrieved 3 June 2011. ^ "HHG2G Exec. Producer Robbie Stamp Answers". Slashdot. 26 April 2005. Retrieved 4 June 2011. ^ "The Hitchhiker's Guide to the Galaxy (2005)". Rotten Tomatoes. Retrieved 4 June 2011. ^ "The Hitchhiker's Guide to the Galaxy". Metacritic. Retrieved 4 June 2011. ^ "Review of The Hitchhiker's Guide to the Galaxy". Empire. Bauer Consumer Media. Retrieved 4 June 2011. ^ Ebert, Roger (28 April 2005). "The Hitchhiker's Guide to the Galaxy". Chicago Sun-Times. Retrieved 3 June 2011. ^ Bradshaw, Peter (22 April 2005). "The Hitchhiker's Guide to the Galaxy". The Guardian. Retrieved 3 June 2011. ^ French, Philip (1 May 2005). "Future imperfect: The Hitchhiker movie is clever but adds little to the radio original". The Observer. Retrieved 3 June 2011. ^ Adler, Shawn. "Martin Freeman: No Sequel For 'Hitchhiker's Guide To The Galaxy'". Yes. MTV Movie Blog. Retrieved 2 February 2014. ^ "Golden Trailer Awards for 2005 at IMDb". imdb.com. Retrieved 24 September 2018. 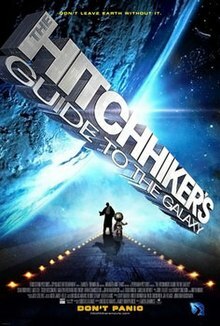 ^ Full list of all award nominations for The Hitchhiker's Guide to the Galaxy at IMDb. ^ "Expired". yahoo.com. 29 July 2012. Archived from the original on 29 July 2012. Retrieved 24 September 2018. The Hitchhiker's Guide to the Galaxy UK Region 2 DVD Release, 2005. Includes commentaries by Garth Jennings, Nick Goldsmith, Martin Freeman and Bill Nighy, and Robbie Stamp with Sean Sollé. Also includes the documentary Don't Crash: The Making of the Film of the Novel of the Radio Series of The Hitchhiker's Guide to the Galaxy. "Hitchhiker Movie FAQ with FUA"